Watch Proof that the marked Dominoes works! This promotional video shows the proof of how effective marked dominoes can be! Scroll down to the buy screen for the product to be purchased! 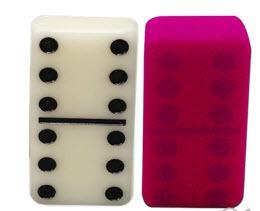 Marked Double Six Dominoes (28 pieces and black case). These Dominoes are marked with Luminous Ink and markings can be seen with a pair of sunglasses or a pair of Infrared Contact lenses. The markings are universal and the infrared device can also read marked cards!